Beadcaps are occasionally referred to as Bell Caps. In jewellery-making, they are most often used to enhance a bead or stone. They can be used to 'cap' just one side of the bead or both. They are also often used to cap the end of a string of beads, as in a necklace, just before the clasp or hook. No matter where you use the beadcaps, they will add a distinct detail and texture to your design. Users often wonder what size bead-cap to use for their beads. Should you use a larger cap than your bead, or a smaller size? There is no general consensus among the jewelry makers. Some feel that using a larger bell cap will either overwhelm the bead itself or cover most of the bead. Some prefer using a bell cap that is smaller than the bead itself so that it 'sits' on the bead rather than covering it. Personally I think it depends on the overall look of your final design. I must admist that I generally using a smaller size ~ sometimes just a size smaller (e.g. 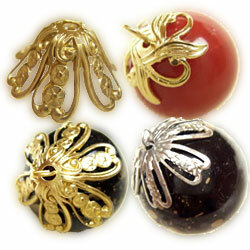 using a 7mm diameter bead cap for a 8mm bead) to a size very much smaller (e.g. using a 3 mm bead cap for a 8 mm bead). It all depends on the final look and what the cap looks like on the bead. The best advice is to try various sizes to ascertain various looks. You just never know till you do!! These days, the bead caps come in such mouth-watering variety and sizes .. from very small onel to long large ones. They are also availabe in a number of colurs & finishes. Humans ware a cap at their graduations. So when you cap your beads, they have graduated as well ... to something even more beautiful! !